We recently spent a month living and working in Prague. And if any Praguians (?) read some of the items on this list, we might not be allowed back. Prague: looks better than it smells. This might seem like a trivial matter to top the list, but c’mon: why do none of the travel guides mention how, even at minor intersections, you get approximately four seconds to cross the street – followed by a five-minute wait? Seriously – there was one crossing so ridiculous that we were going to make a Vine of it. The video didn’t come out properly, but the fact that you can fit the allotted crossing time into a Vine kind of proves our point anyway. Combined with the fact that jaywalking in Prague is a crime punishable by a fine of 2000CZK (around $95), this basically amounts to entrapment. Every establishment you can imagine in Prague has wifi – even those like restaurants and doctors’ waiting rooms which you wouldn’t have thought necessarily needed it. In lots of places we found the connection to be a bit flaky, but we admire the sentiment of ubiquitous wifi all the same – and you can also buy a super-cheap pre-paid SIM card with really fast 3G to fill in the gaps. We’ve encountered our fair share of long faces in Budapest and Sofia in the past, but wow – if you’re going to learn to say “Cheer up, it might never happen!” in any language, make it Czech. A few weeks after arriving, I had one of those experiences where you knew something disconcerting has happened but it takes you a few seconds to pinpoint exactly what. It turns out I’d just seen two people spontaneously smiling at each other in the street. In fairness, and because we might want to go back one day, I should point out that everyone we encountered in cafes and restaurants was endlessly friendly and pleasant – even after we’d exhausted our few basic words of Czech and forced them to speak to us in English. It’s not that the people of Prague are unfriendly – they just don’t go in for public displays of emotion. A monthly travel card costs 670CZK (around $32), and allows you unlimited travel on the metro, trams and buses. It’s a massive bargain, and the tram network is so extensive that we got use out of it almost every day. Would you give away such a bargain just like that? No, of course not – which is presumably why you can only buy it from a few designated spots in the city, and nobody will tell you where they are. After an epic wild goose chase around the city, we eventually located one in Muzeum metro station – we won’t tell you exactly where in the station, because that would ruin the thrill of the hunt. The Prague 7 area (called Letná) reminded us of Park Slope in Brooklyn or Prenzlauerberg in Berlin: very neighbourhood-y, part-family-part-hipster, with cool cafes and great parks. It feels a million miles away from the tourist frenzy of the centre of town, but only about 10 minutes away by tram. For digital nomads, it also has an impressive concentration of cafes to work from. There’s one place in particular that is perfect: we swore to someone that we wouldn’t let the cat out of the bag, but you can figure it out for yourself if you find us on Foursquare and see where we have a ludicrous number of check-ins. We’ve spent much of the last few months loudly proclaiming that digital nomads are mad for not spending more time in Spain, which (as well as being generally awesome) is miles cheaper than nomad hotspots like Berlin. So we were both pleasantly surprised and a bit annoyed to discover that Prague actually is as cheap as it’s made out to be – probably more so than any Spanish city we’ve been to. We got amazing meals for two for under $20, coffee for $1.50, and a full week’s groceries came to $65 – cheaper than anywhere we’ve lived in Europe before. Oh, and while all the beer in Prague is cheap, the best we found was $1.07 – let us know if you can beat that. We identified four primary (and often overwhelming) smells as we wandered the Prague streets: body odour, urine, smoke and weed. Yes, now we’re definitely not going to be allowed back – but it’s true, damnit. In at #5 would be particularly pungent perfume – which we assume is an attempt to mask numbers 1–4. We keep a close eye on canine goings-on in every city we visit: in Berlin they’re very well behaved, in Madrid they’re having a blast, and in Budapest they come in pairs. So this is a big statement, but…the dogs in Prague are the best we’ve ever seen. They’re fluffy, they’re friendly, and (unlike their owners) they seem like they couldn’t be happier with life. And rightly so – many cafes and bars are dog-friendly, and there are plenty of huge parks for them to play in. Our friends bought us a trip to a beer spa as a gift. This seemed like the greatest idea ever as soon as we heard it, and we weren’t disappointed. Basically: you get to bathe in water infused with all sorts of beer-making herbs while using a tap by the bath to pour yourself as much beer as you like, then get a massage, then lie in a heated bed for a while. That sounds odd, but the description doesn’t capture the full weirdness of the situation – I haven’t mentioned the Christmas music, for a start (it was August). It’s touristy, but a lot of fun. And despite the oddness, surprisingly relaxing. In the summer, a truck drives around the city spraying water up into their air – and on hot days, people will chase them down the streets so they can cool down with a free shower. We had no idea if they were intended to clean the streets or cool the tarmac, but a bit of Googling suggests that it’s to damp down the dust. 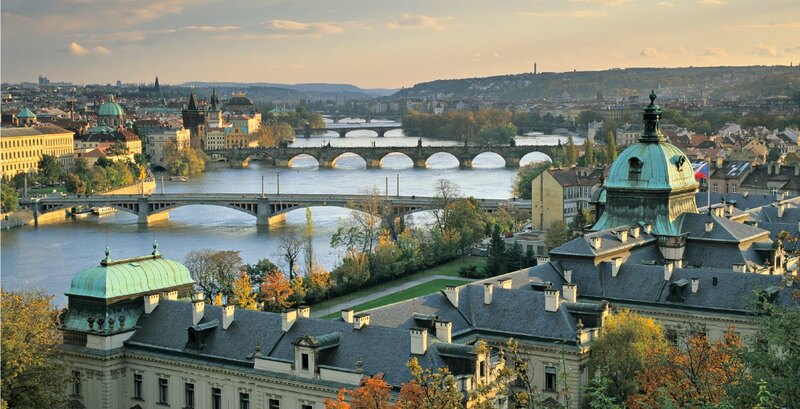 Whatever the purpose, it’s a lot of fun – maybe this is what the natives of Prague are saving up all their smiles for. Posted on October 8, 2014 by Rob @ Making It Anywhere in Travel & accommodation.